Confession: I’ve been a bit slow at adding pictures of some of the fantastic work that my students have been producing recently. So here’s a bit of a box-set for you to feast your eyes upon…..
One legging pattern – so many variations. 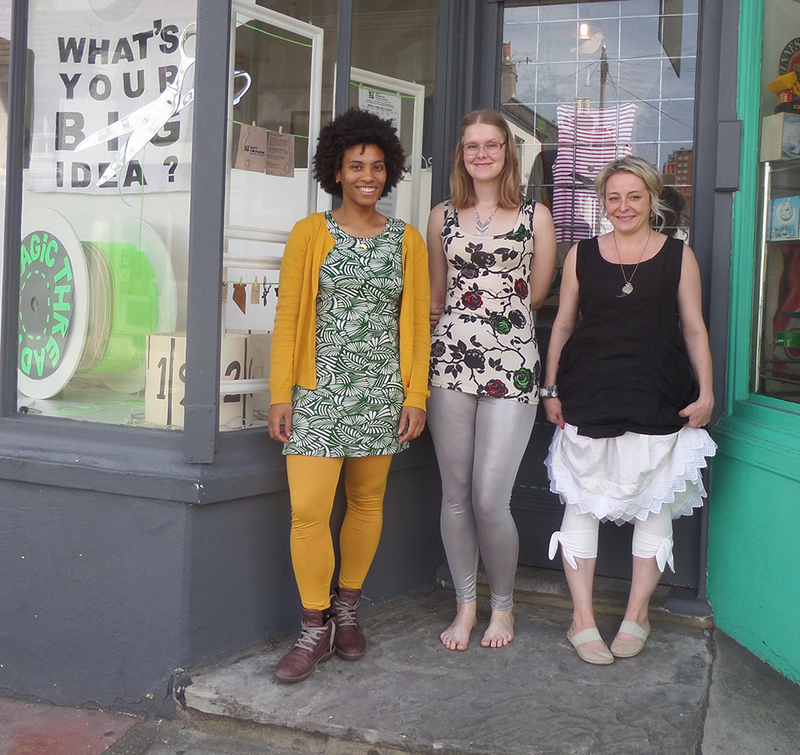 Clair even managed to make two pairs in one workshop! 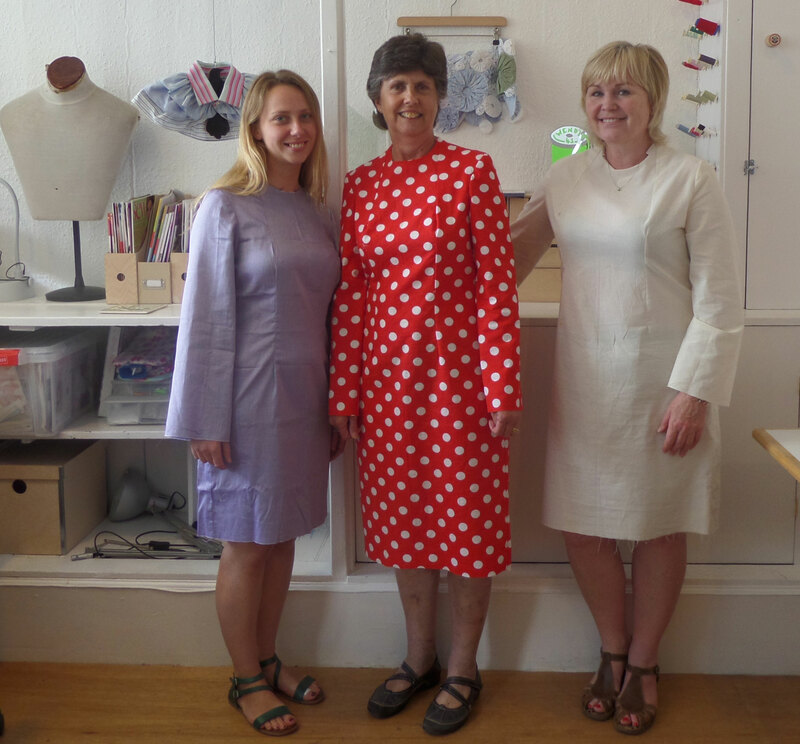 Some beautifully fitting dress toiles at the Pattern Cutting for Dresses 2 workshop. 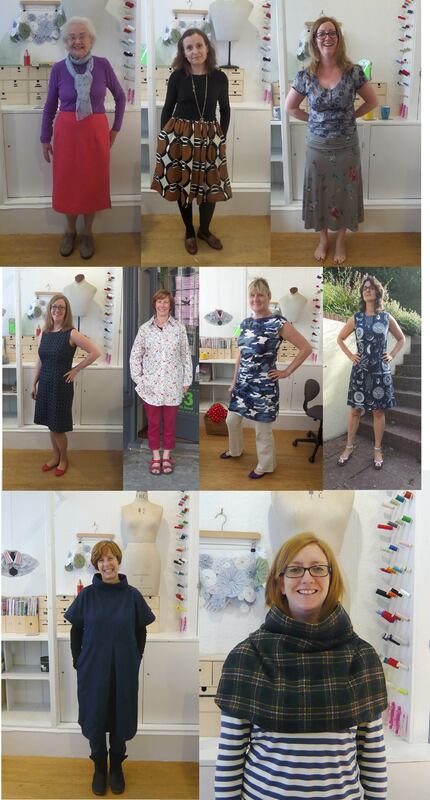 Fabulous frocks at the Summer Frock Making workshop, all made using MIY Collection sewing patterns. 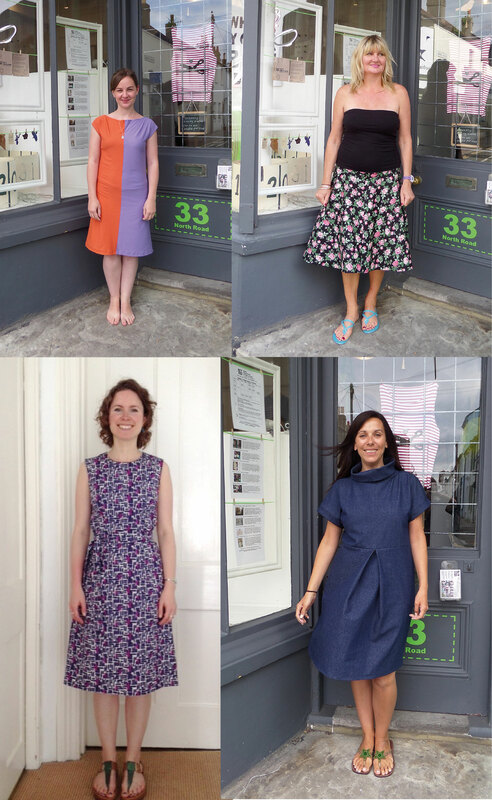 Top row – Joy in her beautiful pink wool skirt which is fully lined, Salva in her dress with beautifully matched print at the seams and Lou in her fold-over waist skirt made from this MIY Collection pattern. Middle row – Lou again in her denim shift dress made using my soon to be available MIY Collection shift dress pattern, Lizzie in a really well-made shirt*, Debbie in one of the many dresses she’s made from this pattern of mine and Assuntina in her gorgeous shift dress** using the same pattern as Lou. Bottom row – Lizzie again in my loose shift pattern and Lou in her cosy cowl (another pattern soon to be available from MIY Collection). *Lizzie started classes with me about a year ago as a complete beginner, not sure if she would enjoy sewing or be any good at it. Hasn’t she made amazing progress?! Partly thanks to sticking with it and practising on her new sewing machine that she went out and bought once I’d got her hooked after a few classes (!) and partly thanks to following a progressive approach to her sewing by making sure that each project she tackled challenged her with something more than the previous one. 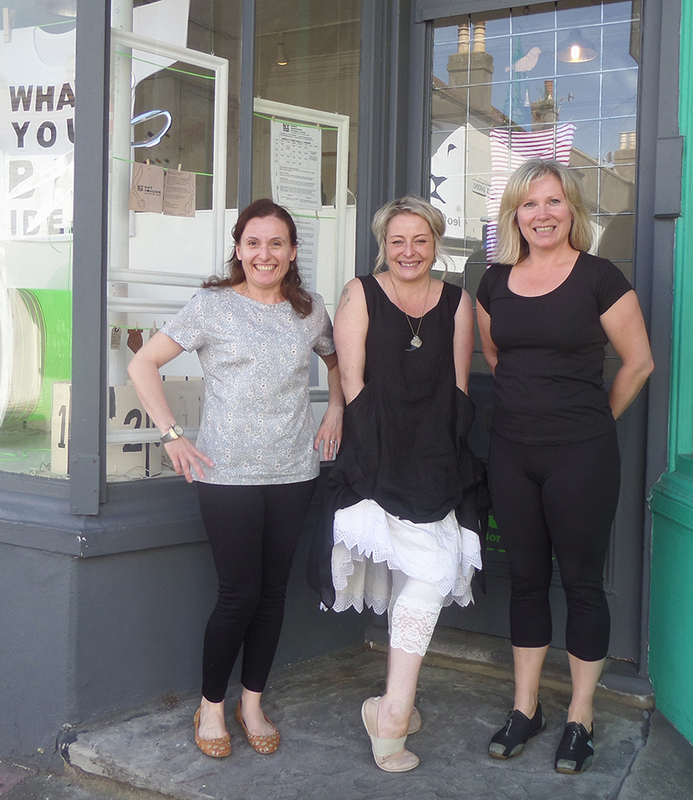 **Assuntina is another example of a student that’s made fantastic progress – starting last year as a nervous absolute beginner she has also taken a progressive approach to her sewing, starting with some easy cushions and now making gorgeous, well-fitting dresses, with skirts and tops along the way. Shirts next Assuntina…..! This entry was posted in Full Day Classes, MIY Collection Sewing Patterns, MIY Workshop, Pattern cutting, Sewing & dressmaking, Student work, Weekly classes and tagged easy sewing patterns, independent sewing patterns, learn to sew brighton, make your own leggings, miy collection, MIY Workshop, modern sewing patterns, pattern cutting classes brighton, sewing classes Brighton, sewing patterns for jersey, student work, Wendy Ward. Bookmark the permalink.